Improving corporate collaboration was the top driver for implementing video, cited by 82% of respondents to the TechTarget survey. 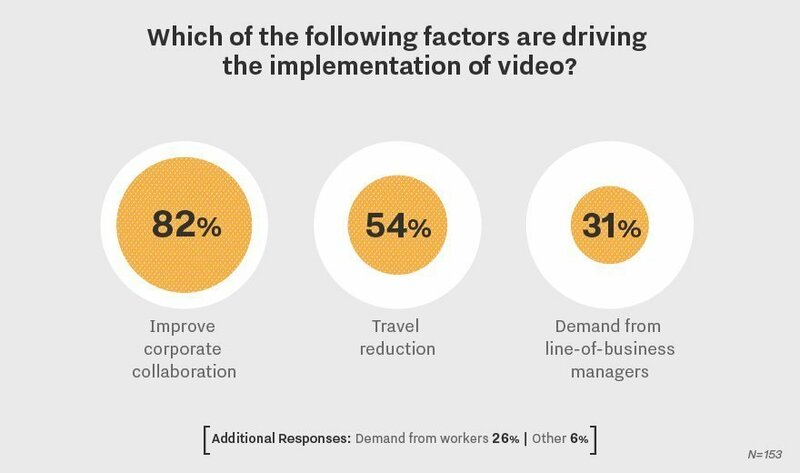 Following improved corporate collaboration, about half of the respondents (54%) said the goal of video implementation was to reduce travel. Video implementation was also demanded by line-of-business managers -- the third-most-cited driver, selected by 31% of respondents. According to Stephen Tong, senior director of infrastructure services at Avanade, video will probably be the last major UC workload to mature. Its uptake has been lagging for practical technical reasons, particularly because of its network requirements. "Out of all the workloads, it's the most intense in terms of requirements from an infrastructure perspective," he said. There's also an adoption barrier related to culture. "If you go around the world ... different cultures have different [attitudes] about person-to-person remote video streaming. Some cultures have a great affinity to it; some don't." In North America, people are still getting used to corporate collaboration over video. "I think most people are fine with it in their personal lives; professionally, it's something that's being adopted but we're further behind than other modes of communication. So we have to be sensitive to that." He noted that video becomes more important as companies look to embed UC technologies into applications, especially those used in scenarios where face-to-face interactions can be preferable, such as telemedicine, remote diagnostics, tutoring and coaching. In what instances have you seen video improve corporate collaboration?